Lie on your left side with your hips and knees flexed, and with a cushion under your elbow. With your left hand, grasp your left thigh under the knee. Exhale as you raise your torso by flexing both your elbow and your waist. Hold for a count of two and squeeze your biceps brachii. Inhale as you lower your torso to the starting position. Repeat the exercise with your right arm. The weight of your torso will be too heavy for your biceps, which is why you also have to flex your waist. 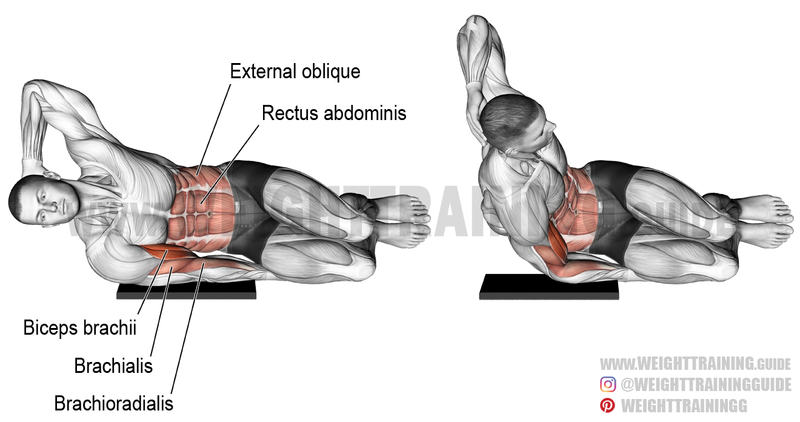 The side-lying biceps bodyweight curl is awkward and requires practice. As you practice, try to minimize waist flexion, emphasize elbow flexion, and get as much range of motion as possible in your elbow. In the absence of dumbbells and barbells, you can also use the biceps leg curl. The demonstration of the side-lying biceps bodyweight curl begins at 0:36. Excellent site here! Helpful exercise pictures.